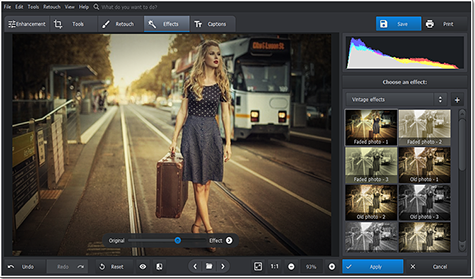 High-level photo retouching doesn’t have to be exhausting or time-consuming. 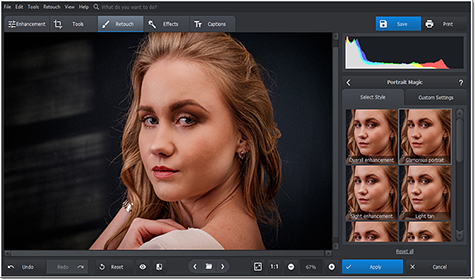 With the intelligent portrait editor, you can get fabulous headshots in a couple of clicks! There is a great variety of ready-made presets to smoothen your skin, remove face shine, conceal imperfections, add light tan, apply glossy lipstick or bring out eyes. Your pictures will be like shiny images from covers of popular magazines. A drab background would undermine even a professional photo. The best way to restore its visual impact is to replace a ruined back scene with something more appropriate and eye-catching. 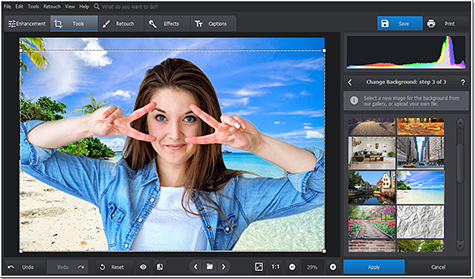 In PhotoWorks, it’s extremely easy to add background to photo and swap skies, transfer your digital self to another location or get rid of undesired objects. The whole process won’t take more than 5 minutes! Captured a spectacular scenery, but unwanted people in the background spoil the view? Make these unwanted guests go away using an array of magical brushes. 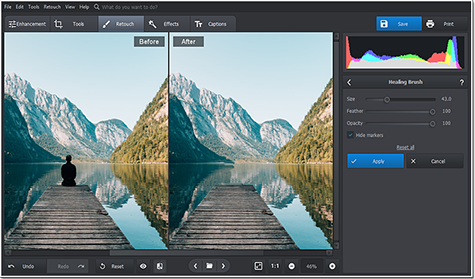 Instantly remove a person from a photo, delete cars, power lines, erase shadows and other objects without any photo-editing skills. Take you pictures even in crowded tourist places and don’t be afraid of slow and clumsy post-production. Make your photo creations even better with a built-in collection of artistic filters - make photos look vintage, turn them into black & white, apply HDR, color splash and many other effects. To achieve a truly stunning result, play with different light and tone settings, recreate the look of your favorite movie and make your pictures look as if they were taken on a classic photographic film. How about turning your polished image into a personalized postcard or invitation? All you need to do is to add caption to photo in no time at all! 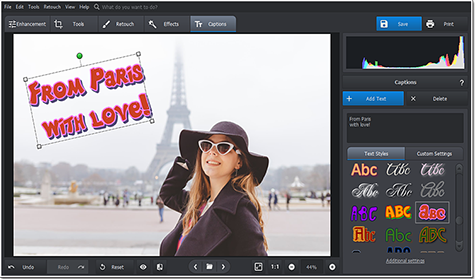 You can either insert a plain description or spice things up with custom colors, fonts and captions integrated into different positions on the picture. This feature is also perfect for signing your creations with an author’s watermark.